The Geffen Contemporary at MOCA. The event is free for all. There will be showcases of artists’ books, catalogues, monographs, periodicals and zines. 250 international presses. Booksellers, and independent publishers from twenty one countries come together to admire each other’s art. There will be artists representing countries such as: Chile. France, Belgium, Australia, Greece etc. 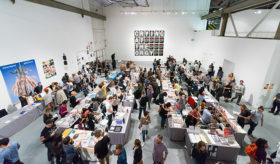 This is a not-to-be-missed companion fair compared to New York’s Art Book Fair. Over the years, the book fair has gotten more and more popularity. Last year’s fair 2016 saw over 35,000 visitors over the course of three and a half days. Each day of the fair has its own unique events. Artists will also have their own mini sessions where they will discuss their latest works and art over the years. The event will occur from Feb. 24-26. On Feb. 24, the fair will open at 1 pm and end at 7 pm. However, the following days, the fair will be open from 11 am and end at 7 pm.